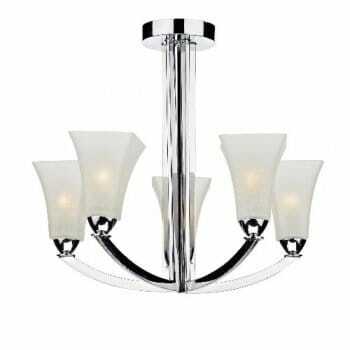 Dar Lighting Arlington 5 light ceiling fitting features a circular design ceiling plate with central rod and a dramatic angular frame, all in polished chrome finish, with curved arms reaching out to opal white square top tapered glass shades. The product code for this Dar ceiling fitting is ARL0550. This striking semi flush ceiling fititng adds a modern yet elegant style and is a perfect choice for any decor within your home, the hand blown, white scarvo glass shades complete the look. The Arlington collection also includes a 3 light ceiling fitting and a single light wall fitting, which can be viewed on our website.